Apparently, I missed a fascinating discussion of advanced physics in my Sunday School class last week. When I was in college, as much as I enjoyed discussions on quantum mechanics, my professor and I had a significant teacher/student differential that was unable to be resolved. I was somewhere in the fourth dimension and well, he was a quark in need of a lepton. But that's another story. Anyway, one of our class mates sent out this cartoon to share. Quite appropriate for the week, actually. 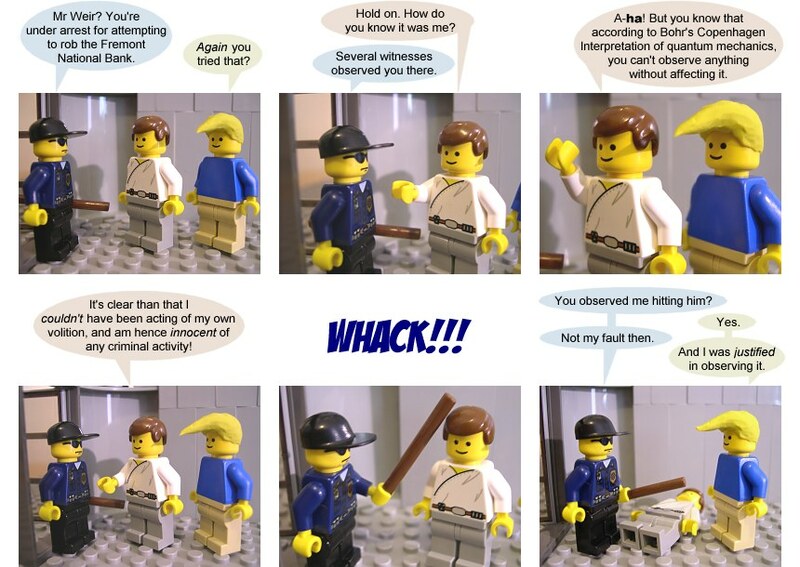 So, as a Lego aficionado and quantum physics fan - I felt compelled to share. Today, I ponder the question, can you really have too many legos? I think it's like asking if you can have too much oxygen in which case the answer is yes, you can if it's prolonged exposure. Here's what happened. May has been the proverbial beehive of activity. We've celebrated the 134th running of the Kentucky Derby (as predicted by my uncle Tony, "Big Brown will be the first triple crown winner in three decades" - only one more race to go to see if he's right! ), hosted visiting out of town family members, been busy with our business, gone to a Brave's game and witnessed our son playing a mini T-ball game in the outfield at Turner Field (actually Doug was a coach out there with him, so it was Nana and I who actually witnessed and video taped the event), watched the last regular T-ball game of the season, attended the all important season wrap up pizza party, attended an Eagles concert, attended the Georgia Renaissance Festival, watched our 5 year old son graduate from preschool and participated in all of the requisite graduation celebrations. And the month isn't even over yet ... there's much more to be experienced! So over the last 20 days, Dominic received a cool lego truck and city ambulance from Aunt Debbie and Uncle Tony. He's been playing with them non-stop - and when asked what he might like for a graduation present (because, naturally, it's appropriate to reward making it through the grueling experience of 3 years of preschool), he said, "Let's go to Target and look." We were amused, so we took him up on the suggestion. I was going to go with an art table - he's been in a creative drawing/painting mode recently so I thought I would attempt to perpetuate those interests. But when we entered Target, he went straight to the Lego aisle. At this point, I knew I was doomed. While he was enjoying his "last day of school" (read in, being administered large amounts of sugar), I purchased more Legos for said graduation gift. I managed to stress over the following things, "will he like them? ", "how long will it take me to help him assemble it? ", and my personal favorite, "will the new pieces, when disassembled, fit into the existing Lego storage "system"?" Graduation day came and went. Admittedly, I cried more beforehand than during the actual ceremony, but my eyes did well up with tears when I saw how grown-up they all looked in their caps and gowns and reflected on how quickly time has passed since he was just a baby (I'm told this is a normal response). We managed to navigate through the graduation event with room on the memory card for pictures, enough battery power, and decent seats for the ceremony. But in all honesty, it felt a little surreal - I came away feeling slightly disconnected. We didn't get to "reminisce" with as many people as I had imagined we would and amidst all the flurry of activity, we kept missing people. But Dominic was extremely excited and since his god-parents, Tante and Unk, were sharing his special day with us, he just knew there would be presents and eagerly anticipated getting home to open them. The ride home went something like this ... "Where are my presents?" "Can I open them when we get home?" "What did I get?" "I know just what I want to open first" and more of the same. I managed (barely) to make it through without laughing and at one time, even delivered with a straight face that if he was not patient, there would no presents at all. But alas, there were ... and of course, that means more Legos. So I woke up this morning, wondering if I am just a consummate enabler. It's not just Legos, I do the same thing with trains, and books. But, I continue to feed the Lego addition (partly because I enjoy playing with them too - also trains and books) and partly because he seems to be genuinely interested in them (and trains and books). We continue to build and rebuild (and rebuild and rebuild - even with the trains and books ... is anyone sensing a theme here?) - but it provides hours of amusement on a daily basis and they're small (although when you step on an errant lego, it can cause severe pain - hmmm, sounds like another "life-is-like-a-box-of-legos-and-here's-why-quote").